The key to any change is to communicate, re-communicate, and then communicate again. You want to make sure that you over communicate as opposed to under communicate the change so that people have multiple opportunities to hear the news. We live in a busy world, and people are bombarded with so many messages that we have learned to tune them out. Make sure you communicate it early and often! 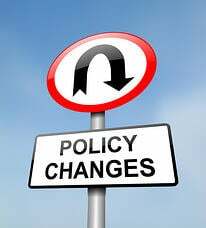 Whatever the policy change, we encourage you to be open about why the policy changed. People want to be informed. If they understand your logic, then most likely they will support the decision. Also share with them how this affects them. Oftentimes, people simply want to know the bottom line:how this will change their life/routine. Finally, make sure people know when the policy will be implemented so that they know when to expect the changes. We can’t guarantee a flawless transmission of your changes - or how people might respond - but your audience is more likely to be supportive if they are aware and understand the why, how, and when.